The G-Shock GMW-B5000D-1 is the first G-Shock watch I’ve owned with the Bluetooth mobile link feature. I was a bit apprehensive about having to set up the watch and learning how to use the new features, but it is actually very easy. This review is mainly focused on the new Bluetooth features of the GMW-B5000 (and GW-B5600) watches for those who are already familiar with operating G-Shock watches like the DW-5600 and GW-M5610, and for those who may be thinking about buying a G-Shock with Bluetooth mobile link. If the GMW-B5000 is not your first G-Shock, you probably don’t need to read the instructions after reading this article. 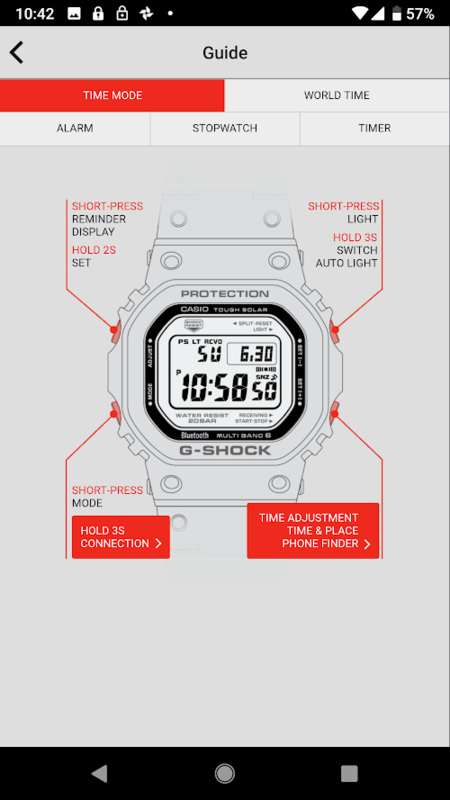 If the GMW-B5000 is your first G-Shock, I suggest reading the full instructions. The watch doesn’t need to stay connected to the phone at all times to use the Bluetooth features. It connects automatically only when it is performing a function or when you manually connect to the app in order to adjust the settings. To manually connect, just open the app and hold the bottom-left button on the watch again. The expanded World Time feature is one of the signature features of the GMW-B5000 with over 300 cities to choose from through the app and up to 5 settable cities on the watch. Make sure the watch is connected before you try to adjust the world time settings otherwise you can’t. You can also swap the home time with a world time in this section. When switching time zones Casio suggests configuring one of the world time settings to your destination, disabling auto time adjustment, and then swapping the home time before you reach your destination. The Time & Place feature will record your coordinates along with the date and time. Activate this feature by short-pressing (not holding) the bottom-right button of the watch at any time while your phone is within range. The watch will connect to the smartphone and log your location (latitude and longitude), date, and time. Using this function will also do a time adjustment and it takes about 13 seconds to complete for each press. This is potentially a very useful feature for certain professions, traveling, and outdoor activities. There are a few instances I can remember where I wish I could have used this. The app provides a log of recorded places and allows you to view a map of each place and add a memo for each record. 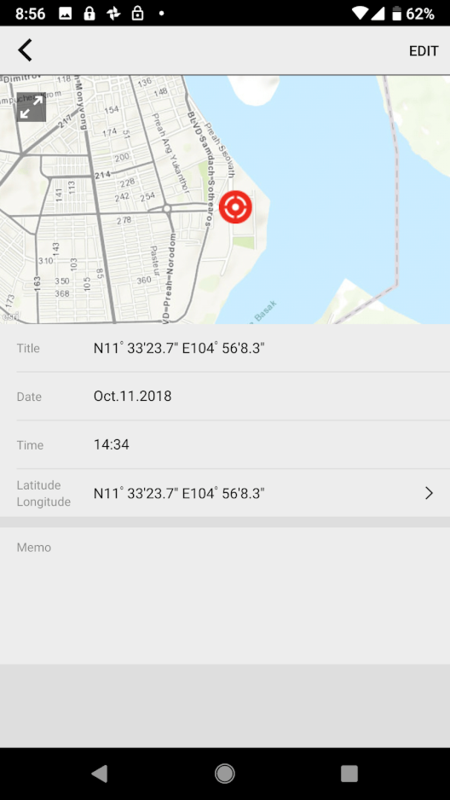 There is no option to open other map apps from the G-Shock app but you can easily copy and paste the coordinates to another app. It is also possible to adjust the location and delete old records. I haven’t been able to determine what the limit is on records in the Time & Place log. The alarms can also be set up using just the watch, but it is a lot easier to use the app especially when setting up more than one. There are 5 daily alarms available, one of which is a snooze alarm. The alarm section of the app is also where you can enable or disable the hourly time signal, which is denoted as “Signal.” The alarm’s beeping sound is like other G-Shock watches, not very loud or long-running, so I wouldn’t count on it to wake me up but it can be useful as a reminder alert. You can also adjust the timer with the app. The timer is not difficult to adjust using only the watch, but if you make a lot of changes that are a lot different from the previous setting then you might prefer to use the app. The Reminder function confused me a little when I first looked at it. I thought it would be like an advanced alarm that you can add text descriptions to, but that is not the case. The Reminder feature allows you to set reminder alerts for certain days (but not times) with a text description of up to 18 characters. This allows you to remember important events like anniversaries, birthdays, etc. The reminders (up to 5) can either be a certain date (with the option of repeating yearly or monthly), a certain period with a start date and end date, or a day or days of the week. Don’t forget to press “Send setting to watch” near the bottom after setting your reminder. On the day of the reminder, “REM” will flash on the display. Pressing the top-left button on shows the description text. After the text is viewed once, the dot between the date numbers will flash to signify there is a reminder for that day and you can view the text again with the top-left button. Also on the reminder day, pressing the top-right backlight button displays the white backlight which then changes to an orange hue that flashes. Based on my testing, if there is more than one reminder set on a certain day, the higher-ranked reminder (such as number 1) will override the others. 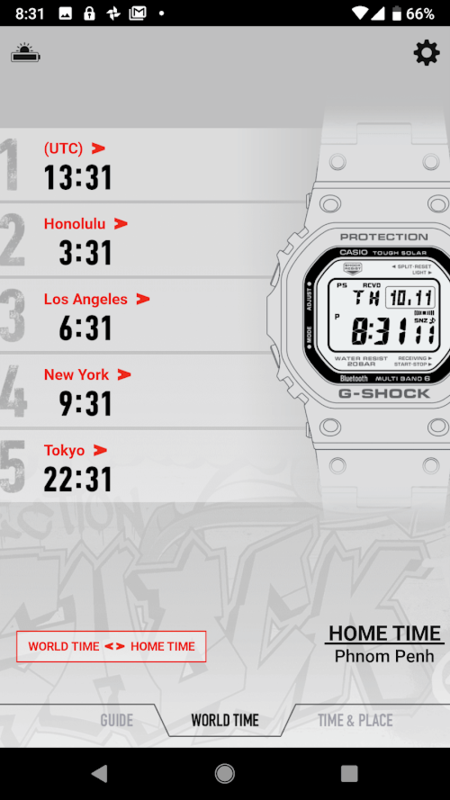 Some other notable features of the G-Shock Connected app include a visual watch guide and a battery level indicator with seven levels. 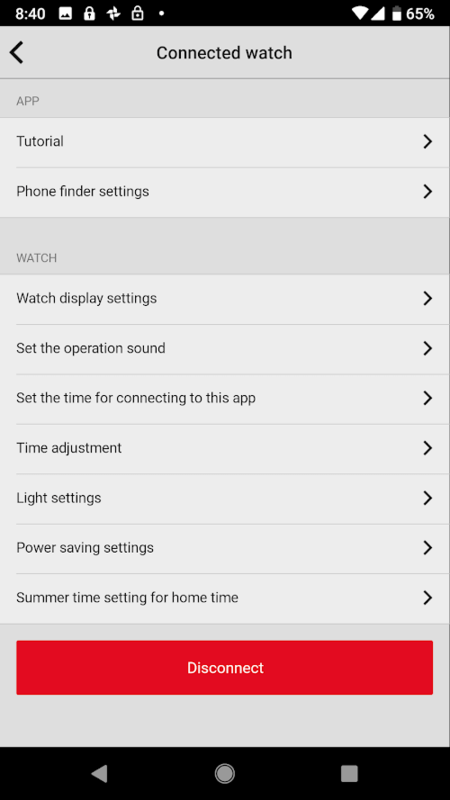 Also, the settings section (gear icon on top right) allows you to change other settings like watch display (12/24 hour, setting month/day order, day of week language setting), button tone on/off, light settings (2 or 4 second afterglow, full auto light on/off), power saving settings, and summertime (DST) setting for home time (auto/on/off). If you change a setting here, don’t forget to press “Send setting to watch” at the bottom. As for an overall verdict of the GMW-B5000D-1, there is not a lot I can say that others haven’t already said. It looks great. It feels great. I love it. It’s simply awesome to have a classy-looking stainless steel watch in the form of the original G-Shock, especially with a screw-back stainless steel case. The GMW-B5000 series is without a doubt the biggest G-Shock release of the year. Though its full-metal appearance is what garners the most attention, the Bluetooth module represents a significant technological advancement on the level of the Tough Solar and Multi-Band 6 features. 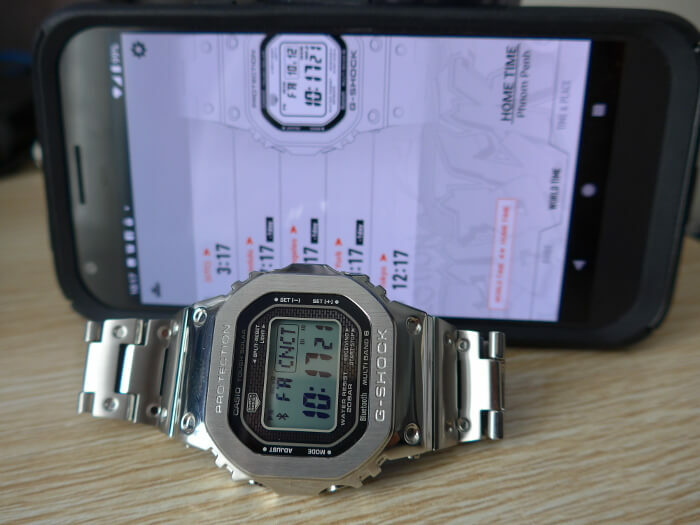 It should be noted that the GMW-B5000 and GW-B5600 watches can also be operated without using Bluetooth or a smartphone, and experienced G-Shock owners should have no problem with that. You can still adjust the time, world time (but with fewer cities), alarms, timer, and the other settings (from the “Other Settings” section above) using only the watch buttons, and you can still have automatic time adjustment by using the Multi-Band 6 feature if you are within range of the transmitters. Without Bluetooth and a smartphone, you won’t have the internet time adjustment, Reminder alerts, Time & Place log, and the Phone Finder function. If you have a smartphone, I see no reason why you shouldn’t use the G-Shock Connected app as it offers more features, makes adjusting the settings much easier, and doesn’t seem to have a serious impact on the phone’s battery life. After having used it for the first time I have a new appreciation for the Bluetooth mobile link feature and highly recommend it. Unfortunately, the GMW-B5000D-1 has been difficult to purchase at the list price (though not impossible if you continually check the official G-Shock dealers online). Although it is a standard release model with more stock expected to come, it is still hard to find before it sells out. Casio is also releasing some new GMW-B5000 models with the GMW-B5000GD-1 and GMW-B5000GD-9 featuring black or gold ion-plated finishes and negative STN LCD displays. Another new series with the same features as the GMW-B5000 but with a more affordable price is the non-metal GW-B5600 with resin or composite bands. The GW-B5600 watches will be the most affordable G-Shock watches with both Tough Solar and Bluetooth. There are also several other Bluetooth-equipped G-Shock watches with some (but not all) of the same features as the GMW-B5000, and we are likely to see even more new Bluetooth models in the future. I feel like they should update the watch over the air like you can with headphones that allows notification access. This way, you could have the watch read out notifications like their old mobile link watches would do. If they don’t add that, they should at least add daily repeating, by-time reminders.